Her 14-inch guns came to life at 5:30am on June 6th, 1944 just off Omaha Beach. It was the start of D-Day. 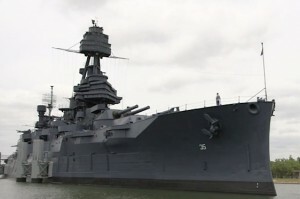 In commemoration of this pivotal moment in World War II, we spent a day on The Battleship Texas, now resting at San Jacinto, documenting some of the 725,415 miles she steamed though both World Wars I and II. Best of all, we got to shoot in parts of this ship few ever see. The Texas is credited with advances in gunnery, aviation and radar. Then, after the war, she spent three months ferrying home American troops before being decommissioned. The HomeShow Video feature we produced aboard The Texas earned MogerMedia gold in the national Communicator Awards competition. While we’re proud to add this trophy, along with 18 others won this year, to our case, we remain humbled by and grateful for the men men who served aboard this might ship in both in time of war and ever since preserving her for the ages. So awesome. Probably the best short documentary I’ve ever seen. What an awesome subject, too. Love it.